About a month ago, I was weeding a garden behind our house with the kids when I caught sight of Sofia in the garden (forbidden territory), wielding a little Frog House like a banner. As I hurried toward her to rescue the fragile house and any nearby flowers, I heard an odd rattle. Sofia giggled and shook the Frog House again, and again I heard the rattle, this time noticing some dry grass sticking out of the bottom. Oh, no. 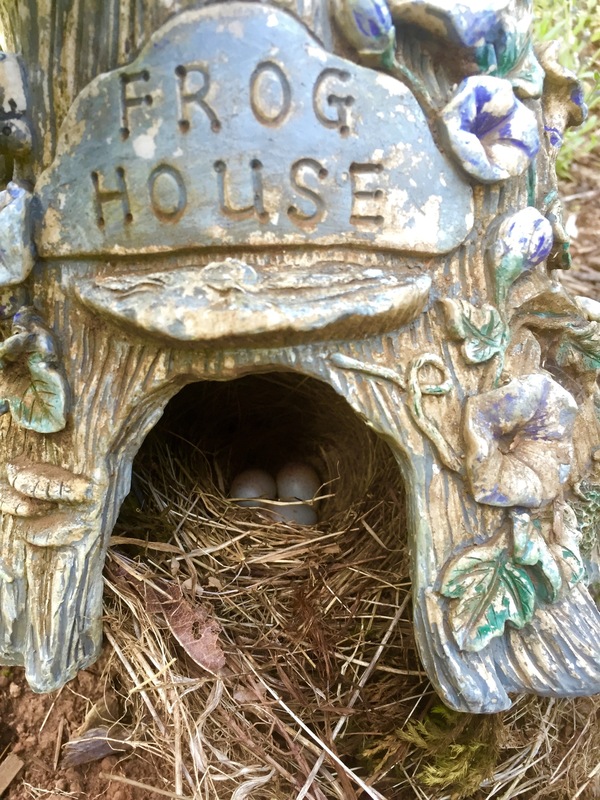 Someone had built a nest on the ground inside the Frog House, and now my child was rattling the poor little eggs inside as if it were a maraca. The mama bird never did come back. I was able to identify the eggs as almost certainly belonging to a dark-eyed junco, and I eventually took it to Niko’s teacher to use in a little nature center. 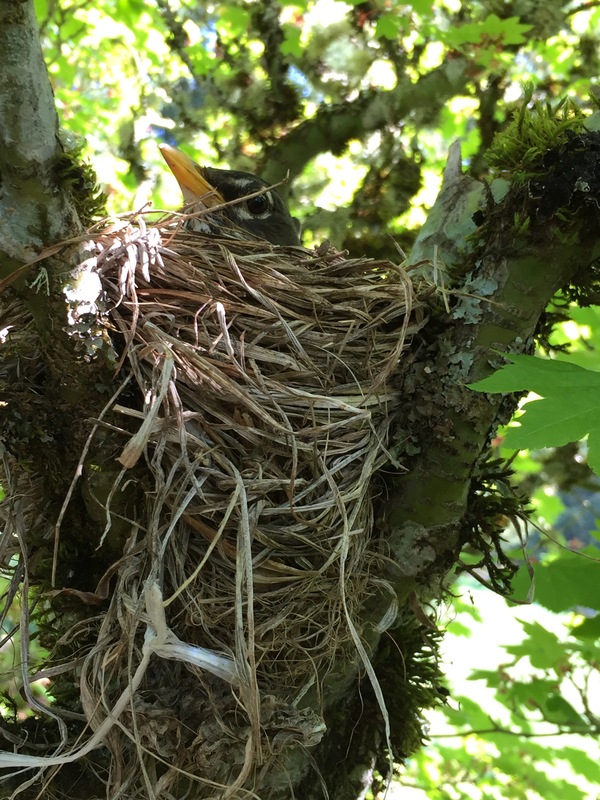 After the disappointment of not being able to let the kids witness the eggs hatching and seeing baby birds, I was delighted to look up not long after that and see, up in the large vine maple behind our garage, a new nest — complete with a patient robin. I’ve been watching the nest ever since, hoping to get some photos when the mama was away. Today I thought I had my opportunity. I climbed up a very high ladder to get a picture of what I thought was a momentarily empty nest, only to find mama very much in residence! I didn’t want to scare her, so I just snapped off a couple of photos from a bit more of a distance than I’d hoped. Nevertheless, I’m thrilled that we have an active nest. Last year a pair of robins built a nest right by our door. I was sure they would be disturbed one too many times and abandon the nest, but they actually had 2 sets of babies, 4 each time! That’s pretty cool. Our robin’s nest is right above our Adirondack chairs and fire pit, and I keep worrying we’ll scare her off, but she’s stayed put so far.